From the very beginning of the radio, we recognised that music plays a very important role in the preservation of different norms and cultures, as well as being a medium of passing on wisdom. Music also is an easy means of getting information to the people in an entertaining but very informative way.The initial idea behind the radio starting to record music, was to promote the local Tonga music and musicians, and also to provide all time entertainment for our listeners. Tape production was a popular demand by the people. At the same time, were looking for a way to support the radio station operating. So the tape production department started as a means to help the radio station to be self-sustainable and provide quality music on a cassette tape, a medium widely used in rural areas. 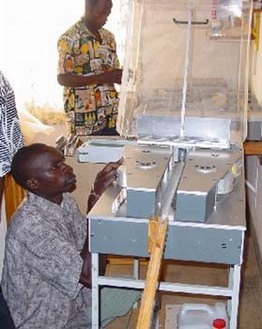 The tape production facility in Chikuni has benefited not just the local musicians. With the passage of time, there was a need to increase and improve the facility to cater for the overwhelming demand from across the country.A number of Zambian musicians had their music produced on the cassette tapes in Chikuni. Their music has been promoted on air both by playing their music and interviews given to our broadcasters. What’s Required & What’s The Process? Mass production of audio cassettes of high quality is not an easy thing. It takes determination and honesty to keep your customers satisfied at all times. The law is what protects the weak or the poor from being oppressed. The production team has endeavored to produce music of very high quality. We use digital bin, which means that we copy from CD masters directly to the tape. Two CD-ROM masters are made for either side of the tape to feed the digital bin. The actual length of the tape is determined after the masters have been made. The blanks are wound to the precise length. Recording then starts. Sound recording levels are constantly checked to make sure the quality is at it's maximum. After recording there’s the process of printing on the body of the cassette shell. A special plate is made for the on-body printing. With the inlay cards provided, the tapes are packed and shrink-wrapped, ready for consumption. The station does not provide accommodation facilities and we operate from 07:30hrs to 15:30hrs from Monday to Saturday. You will find Mr. Blaize Haalwiindi in the forefront of the production. Many thanks to the other radio crew for the great assistance they render towards the production of the albums. Price shown subject to negotiation on quantity. Minimum order value of K450,000. Payment with order or 14 days from date of invoice for established customers. Turnaround - from approved master: approximately 7days. Re order: approximately 5 working days.